HOUSTON, Texas - NASA is taking another look at the decisionto cancel the Dawn mission that would explore two large asteroids in the solarsystem. The space agency officially killed the missionearlier this month, citing an independent assessment that flagged over twodozen major issues in need of resolution before Dawn was ready to go. The abandonment of the mission was also due to its increasedcost growth of 20 percent over Dawn's confirmation cost cap of $373 million, aswell as a 14-month or more delay in launching the spacecraft, NASA officialssaid at the time. The death of Dawn has stirred up anger in scientificcircles, both in the United States and abroad - a fact that surfaced hereearlier this week at the 37th Lunar and Planetary Science Conference (LPSC). When pressed by scientists to clarify whether or not theDawn mission has been restored, NASA Associate Administrator for Science, MaryCleave, said NASA is responsive to Congressional language that dictates "if weget to a certain percentage cost overrun we have to review a project. And if itgets to another percentage Congress will zero the money going in and we will bein this limbo with no money going in." Another reply regarding the status of Dawn came from AndrewDantzler, director of NASA's solar system division in Washington, D.C.
"I really can't get into the details on Dawn," Dantzler toldthe LPSC gathering, but noted that the cancellation "is under review by ourmanagement." Because of that fact, he added, it would not be appropriate to getinto specifics. The cost to standdown Dawn was slated not to be more than $5 million dollars and hasn'tbeen, Dantzler said. "Continuing Dawn is significantly more," he said. Dantzler said that termination of a mission or a budget cut"is a very serious issue," with NASA doing everything it can not do that. In terms of the technical problems of Dawn, Dantzler saidthat "it would not be wise to go into technical detail." While the findings of a new review are yet to play out,NASA's cancellation of Dawn in the first place incensed scientists, not onlythose in the U.S. but in other countries taking part in the mission. "It's totally unacceptable what's happening now," saidGerhard Neukum, professor of planetary sciences at Freie Universit?t Berlin inGermany and a member of the Dawn team. There is international involvement in Dawn, Neukum pointedout. "NASA has responsibility to their cooperation partners first and foremostbefore they go to the last resort of canceling a mission," he told SPACE.com. "It's absolutely ridiculous what NASA is doing," Neukumsaid, "because most of the money has been spent." Neukum noted that "the mission is practically ready to go.There are a few technical problems that are overstated on NASA's side. It's nota well-based, neutral review in my opinion." "We didn't know what was going on," Neukum said. "If thereis cost-overrun you just can't go on," he admitted, but added: "You have toreview it and see where it comes from and then try to remedy things. You findthe cause and possibly save the mission. That should be the first goal." The response from NASA officials here at the LPSC meetingconcerning the cancellation of Dawn seemed to Neukum as if they cancelled themission to free some money for other purposes. "This is absolutely unacceptable what's going on there. Itwas unilateral, without prior warning and no discussion," Neukum said. "I knowthat there were some other technical problems, but no fundamental ones. Theyall could be fixed," he explained. Dawn is under the rubric of NASA's econo-class Discoveryprogram. It was selectedin December 2001 to be developed on a fast-paced schedule and at modest costcompared to so-called "flagship" missions. 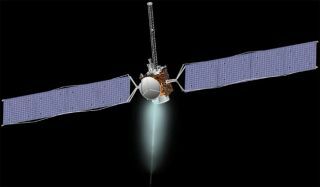 Using ion propulsion, Dawn's objective has been to reachasteroids 4 Vesta in 2011 and 1 Ceres in 2015. By surveying those mini-worldsup-close, scientists want to glean clues about the formation of the solarsystem. Dawn is managed by the Jet Propulsion Laboratory (JPL) inPasadena, California with Orbital Sciences Corporation of Dulles, Virginiadeveloping the spacecraft. The mission was slated for liftoff in mid-June 2006, butlate last year was placed in "stand down"mode. Mounting technical issues and cost growth in the project led to the standdown, with an independent assessment team tagged with the duty to look into theproblems. The scuffle over Dawn was spotlighted by Jonathan Lunine,Professor of Planetary Sciences and of Physics at the University of Arizona inTucson during a major talk at LPSC on the future of solar system exploration. "Dawn -- which actually did get canceled but is now on somekind of life-support...or there's some religious ceremony in which it's beingresurrected -- if it does go to two very large asteroids, Ceres and Vesta, itis a very important mission."